Mr. Heater 10,000 to 15,000 Btu Outdoor Tank Top Propane Heater/Cooker (MH15C). Comes with an adjustable low, medium, high heat control, a stand to convert use between heater and cooking stove, and an automatic safety shut off in case of loss of flame. Operates on a 1 lb disposable propane cylinder. Direct replacement for the Paulin 3500-EZ Heater/Cooker. The Mr. Heater MH15C Propane Heater is a tank top heater that attaches to the top of a 1 lb disposable propane cylinder and comes with a foundation base that allows you to alternate use between a space heater and cooking stove. The propane cylinder is not included. This outdoor only space heater is similar to the MH15 but can also be used as a cooking stove. The MH15C heater/cooker has an adjustable high to low heat control with a 10,000 to 15,000 btu range and an automatic safety shut off is also included. This small, easy to pack, space heater is perfect for all outdoor recreational activties including camping, fishing, hiking, and tailgating. 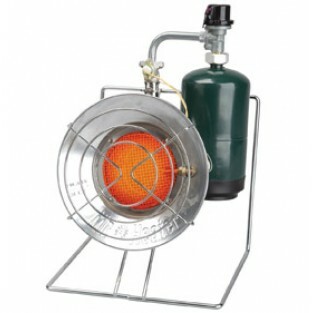 The Mr. Heater MH15C Outdoor Propane Heater/Cooker is the direct replacement for the Paulin 3500-EZ Heater/Cooker.